Just announced Microsoft Lumia 650 is bound for Cricket Wireless? Earlier today, we told you that the Microsoft Lumia 650 had become official. Made for the enterprise, the device does feature a 5-inch screen (with a 720 x 1280 resolution), although the remaining specs are quite lacking. For example, under the hood you will find the Snapdragon 212 chipset carrying a quad-core 1.3GHz CPU. There is also a 2000mAh battery, and 1GB of RAM. 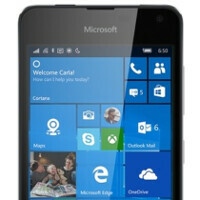 Today, Microsoft has posted a support page for the handset that links to a user guide for the phone. The listing for the guide on the support page mentions the Cricket name, and from that we can state that the low-priced handset will be made available to AT&T's pre-paid subsidiary. While pre-orders for the phone are already being taken overseas with an eye toward a February 18th launch, Cricket isn't expected to make the Lumia 650 available until April. The Microsoft Lumia 650 will probably be sold for around $200 at Cricket. And while this model has the latest Microsoft Office apps pre-installed right out of the box, most businesses that plan on giving the device to their employees will purchase them through other channels. Cricket will most likely concentrate on selling the handset to consumers as a low cost phone to go along with its pre-paid service. I think it will be. Soon after the sales kick off and they realize it's not selling well. Should be $69/79 considering the specs. S212 for $200? Lol DOA. This should be free with a free 3 months worth of service. It's a business phone the specs are adequate for what it's intended I suppose however having continum support would've made sense so I thanked theyved erred bigtime in both specs and price ie a better processor that supports both continum and cortana full version. True. Why even release a phone with these specs to market. May be its better MS put that money and effort in building better app and eco system.